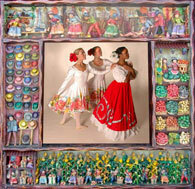 Retablos, Booker T. Washington Magnet High School, Montgomery. This AIE Program component provides support for specific projects that advance the goal of the arts as an essential component of PreK-12 curriculum. Projects must seek to establish, expand or advance arts education as defined by the Alabama State Department of Education in the Alabama Course of Study: Arts Education. * Trips out of state or abroad do not receive priority, and must be related to a specific project that will have long term impact. Projects may include classes, workshops, consultants, guest artists, performances, exhibits, professional development, residencies and activities designed to advance the quality of arts curriculum in PreK-12 schools. Grant funds must be used for projects that promote learning in and through the arts, including comprehensive sequential arts instruction and/or arts integration. Grant funds may be applied toward consumable materials only as they relate to the implementation of a specific project. Funds may not be requested for administration, materials or supplies not specific to the proposed project, band uniforms or instruments. Applicants may receive funding for the same project no more than three times within a five-year period. Proposals will be judged according to planning, educational benefits, and inclusion. Please refer to the rubric provided here at Evidence of Excellence for guidance in how to include specific information on the general egrant form. Applicants are required to submit supporting documentation, including a complete and detailed schedule of planned activities, artist or group contracts or letters of intent, artist resumes, and samples of curriculum materials, such as lesson plans, that illustrate the use of arts content standards, objectives and assessments. No more than 10 pages of support materials (one sided) will be sent to reviewers. You may include in your support materials links to websites, and YouTube sound and/or video links. Applicants may be individual schools, school systems or non-profit organizations, and may apply independently or as a collaboration/partnership. Any partners listed in the proposal should include letters of commitment in support materials. Institutions of higher education are encouraged to apply under this component for projects that address curriculum development and/or professional development in arts education. Curriculum-Based Project grants must be matched dollar-for-dollar in cash, or a combination of cash and in-kind support. There is no limit on how much may be requested. However, grant amounts rarely exceed $10,000. It is highly recommended that applicants seek advice and support from the Arts in Education Program Manager, Diana F. Green, when applying for Curriculum-Based Project Grants.